If you ask me, home security should not be taken lightly. Beefing up your home's security should be done at all times and not only when the whole family leaves the house for school, work, or a long family vacation. Never fear, securing the home need not be expensive as there are a lot of simple and cost-effective ways to do this. How secure are your doors from intruders? The locks on your doors are your first lines of defense. It will just take one weak lock for burglars to enter your home. 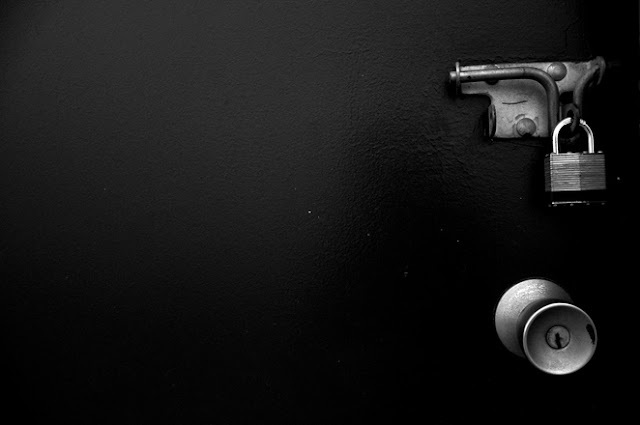 Aside from the door knob's lock, install a dead bolt lock or a hinge lock as secondary protection. What good is a strong lock when your door's weak? Hollow doors are easy to destroy, thus, also destroying the lock that you installed. Make sure that your front door and all doors that are accessible from outside your home is made of strong wood, metal, or glass. The locks should be working and the glass should be strong. If you have sliding glass windows, like ours, make sure that the locks will not be loosened by tapping or moving the window panes. I had all our window locks changed because those that came with our sliding glass windows were weak. I'm also planning to have grills installed soon. If the street lamps are not bright enough in your area, switch the porch lights on. If you worry about your electric bill, then opt to buy LED light bulbs or, if your budget permits, install lighting that has daylight sensor or a timer. Keep your ladders in a locked up shed or inside your garage. Also make sure that your home's fire exit ladder cannot be used by burglars to go up your balcony or windows. We often see it in the movies and this is really not a smart move. Do not hide keys under the door mat, flower pot, porch bench... anything outside your home. Have your front door keys duplicated so everyone in your home has a copy and you won't need to hide it under the door mat. Our former neighbor's house was robbed when burglars pushed their aircon, making it fall inside their room. Then, the burglars had a small boy enter the hole and had him open the front door for them. They lost every valuable they had all because their window-type aircon was not secured by a grill. The goal is to make securing the home a habit and this should be taught even to young kids. Someone in the family, probably the dad or the mom, should be assigned to check if all doors are locked before going to bed. Kids should be taught not to open the door to strangers and always keep it shut. Lastly, have emergency numbers posted in common areas of the house. You need not spend a lot to have your home secured. By doing these simple steps, you can deter burglars from entering your home, sleep soundly at night, and have peace of mind whenver you're away.